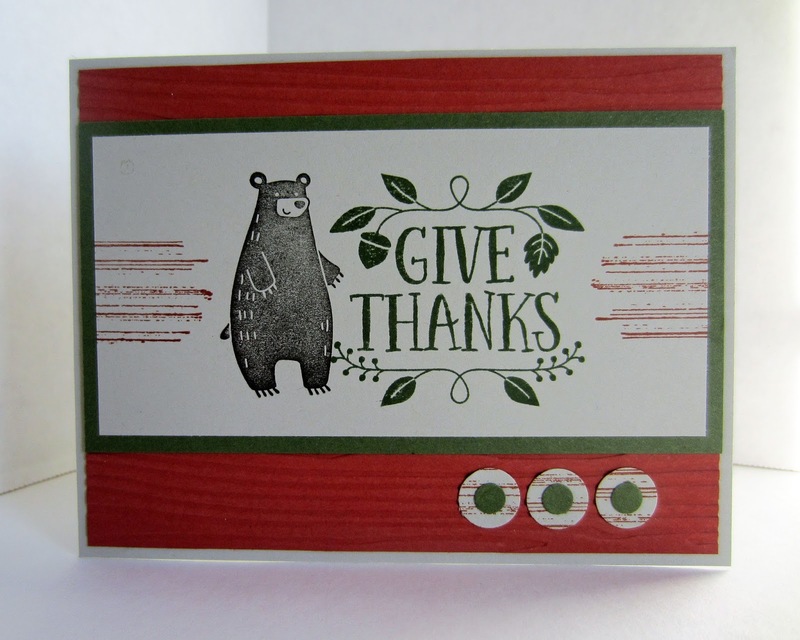 The stamp set, Thankful Forest Friends, (page 43 of the Holiday Catalog) made it lots of fun to create my handful of Thanksgiving cards this year. The animals in the set -- fox, bunny and bear -- simply tug at my heart strings. For my card, due to his height, I chose Mr. Bear. He was stamped in Early Espresso, the Give Thanks design in eye-catching Mossy Meadow. To add a little interest to the white panel, and to complete the design, I added the wood-like stripes from Gorgeous Grunge (page 123 in the big catalog) in Cajun Craze. To echo the wood look and round out the forest feel, I set the panel atop a Cajun Craze piece embossed with the Woodgrain folder. Before I adhered the embossed piece to the card base, I added a rich-looking Mossy Meadow ribbon. For my daughter, Sarah, who was in the Army, I changed things up just a bit. I thought the colors I chose were slightly more military in style. Do you normally go all out in making Thanksgiving cards for others? 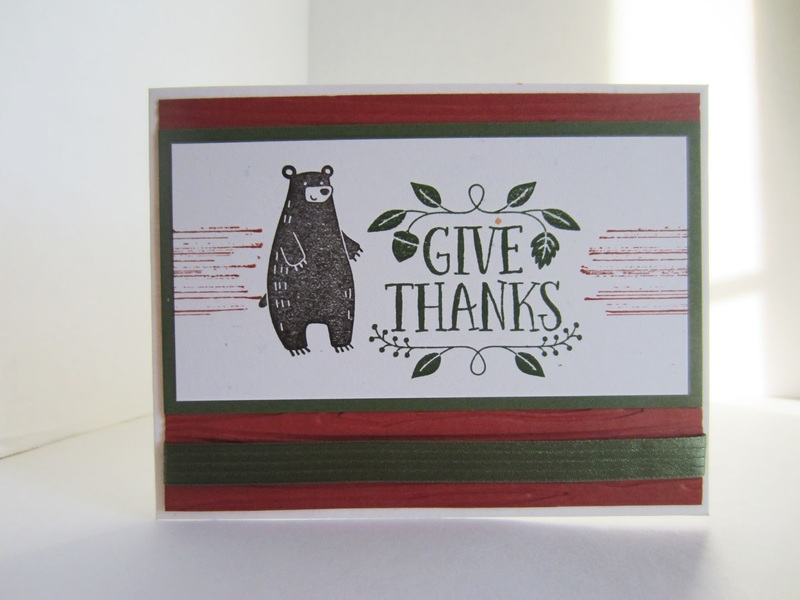 Or do you save all your efforts for your handmade Christmas cards? Speaking of Christmas cards, how are you all doing on your creations? Share with us how many you plan to make or have made! Enquiring minds want to know! I love both of your cards. No card-making plans here. I have never made Thanksgiving cards and last year went all out to make memory card books for each of my kids using Starbucks cups. Thanks for sharing on Friday Features this week! Thank you for sharing this week at Brag About It link party on VMG206 (Mondays at Midnight). This is darling! I definitely think Thanksgiving cards are a great idea! Thanks for linking up to You're Gonna Love it! Pinning!